Gravity Enduro - Race ya mates ! 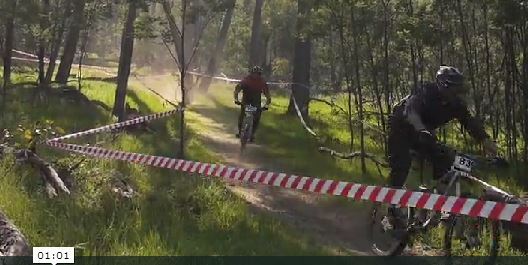 Gravity Enduro, or just Enduro as it's known internationally spawned from it's motorized counterpart of the Same name. Enduros were designed as a point A to point B journey which included a number of timed stages within the course. The accumulative time of these timed stages was then added together to decide the Winner, lowest time wins. Another good comparison is that of a Car Rally, where the vehicles must travel from stage to stage under their own power. In Mountain biking the principals are the same. However, we use climbs as the non competitive stages and the downhills as the timed competitive stages. Timed downhill sections should Ideally consist of approx 85 to 90% downhill with short uphills. The Downhills will be a mix of Technical trail, and Fast single track. Not as brutal as a Downhill course, but enough to warrant using a mid travel bike. However, bike choice is entirely up to the rider. A course will be determined and marked the morning of the event. Riders will then set off at their leisure and upon arriving at the start point for Stage one, set off at 30 second intervals trying to set the best time. Once completing the stage, it is then up to the Rider to follow the course to the next stage at his own pace. The Nature of the event allows for rides with Mates, and a laid back approach to competitive racing. After completing the full course and all the required stages, Riders will then arrive at the final checkpoint and receive a print out of their times for the day. They can instantly compare with fellow riders to see how they fared. Once everyone has checked in, the rider with the lowest accumulative time will be announced the winner.